Forever 21 jumpsuit (similar style here), Vintage silver and beaded necklaces, Thrifted silver bracelets, Rebecca Minkoff Tri-zip satchel (also seen here), Bershka half-frame sunglasses (similar here), Suzie sandals c/o Madison Harding. I was in New Hampshire last weekend for a wedding, so Micol and I didn't have a chance to shoot new looks, but we wanted to share with you the photos above, which make up part II of our trip to PS1 a few weekends ago (if you missed it, check out part I here). 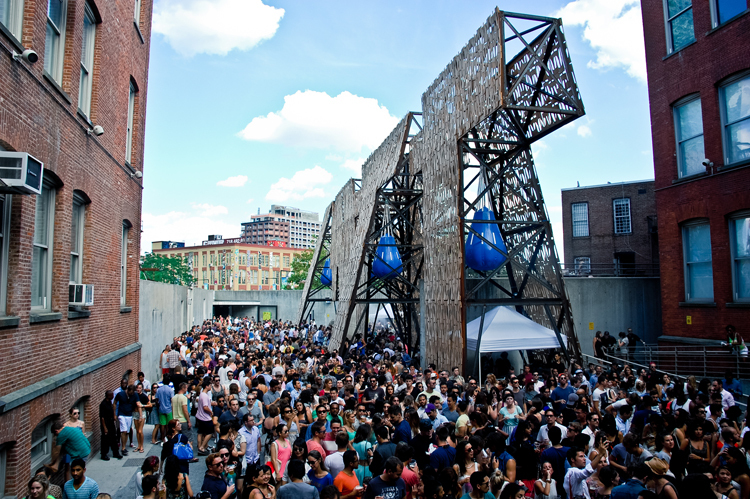 For those of you who have never been, you MUST check out PS1 on Saturdays during the summer when they hold their weekly Warm-Up sessions. The DJs are usually awesome, the crowd is super chill, and you get access to the whole museum as well as the yearly outdoor art installation designed by winners of the Young Architects Program. This year's installation was a massive 'party wall' designed by CODA, the photos of which you can see above. 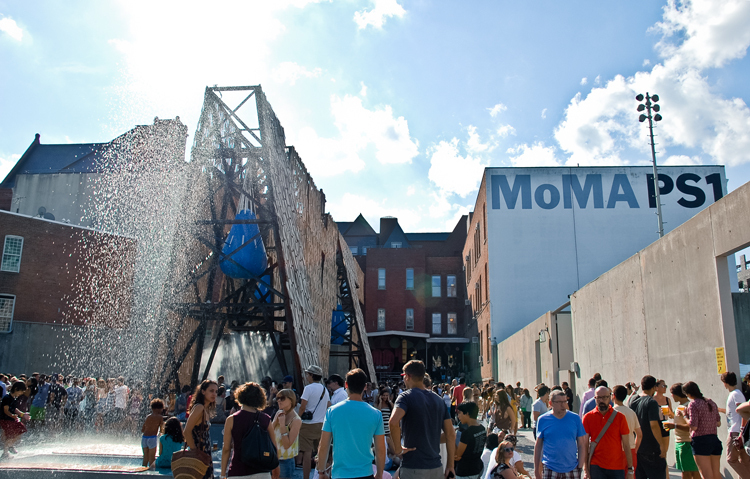 According to PS1's website, "The porous façade is affixed to a tall self-supporting steel frame that is balanced in place with large fabric containers filled with water, and clad with a screen of interlocking wooden elements donated by Comet, an Ithaca-based manufacturer of eco-friendly skateboards." The skateboards were also scattered across the outdoor space, providing portable seats for us to relax on. In all, it was a truly unique and fun museum-going experience that I highly recommend. This looks like the perfect summer festival outfit!! The event sounds SO fun! Amazing look and I lovee the smile shots. Stunning once again ladies. love that onesie! it's so cute and flattering. Your shoes are so pretty!! Looking amazing, loving your jumpsuit!! I have never been to this festival but I guess I have one more weekend to give it a shot. One word...love! I'm so jealous of all the awesome NYC graffiti and wall art that you girls get to use as backdrops. Cute outfit!! Loving the setting. Loving this look! That jumpsuit and the sunnies are great!! Sounds like such a fun event!! great look, love the necklace, very eclectic. Wow, that looks awesome! And I love your jumpsuit! Great look!!!! I like it a lot! Sunnies are my favorite in this look actually!!! Girls, I'll be sososo happy if you could also follow my blog. It will be such a gift for me. Thanks for your attention, girls! PS1 is the best, I completely agree and loving that one piece too!